This flavor was formerly known as Lemon Zinger (Citron Trippant). 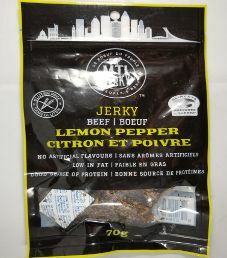 The next review for MTL Jerky will focus on a 2.5 ounce/70 gram bag of their Lemon Pepper (Citron Et Poivre) flavoured beef jerky. The flavor is described as combining the sour taste of freshly squeezed lemons, the citrusy punch of fresh lemon zest, and the heat of freshly ground black peppers. The jerky was graciously submitted for review by the owner, Alexander Halasz. Ingredients: Beef (Eye of Round), Lemon Juice, Unpasteurized Honey, Sea Salt, Pepper, Raw Sugar, Lemon Zest, Granulated Garlic, Pure Lemon Extract. Ingrédients: Boeuf (Noix De Ronde), Jus De Citron, Miel Non Pasteurisé, Sel De Mer, Poivre, Sucre Brut, Zest De Citron, Ail Granulé, De Citron Pur. The liquid marinade used here is comprised only of healthy lemon juice, and a commendable unpasteurized honey. There are some healthy ingredients added such as black pepper, lemon zest, granulated garlic, and pure lemon extract. The fruit lemons are loaded with vitamin C, and offer health benefits such as preventing kidney stones, reducing cancer risk, and improves digestive health. The level of sugar is a little high at around 5.5 grams of sugar per 20 grams of jerky to lose a rating. Our preference for a fruit based flavor is 4 grams of sugar or less per 28 grams of jerky. The salt level is a tad high at around 364mg of salt per 28 grams of jerky, where we prefer 350mg of salt or less per 28 grams of jerky. However, the salt level is ignored because healthy minimally processed sea salt is used. This jerky does qualify to have no sodium nitrite, or any other similar unhealthy preservatives. Instead, the main preservative used is sea salt. Commendably, there is no MSG added. The MTL Lemon Pepper Beef Jerky is absolutely outstanding! This wonderful combination of cracked black pepper and lemon with light garlicky notes is way kicked up. 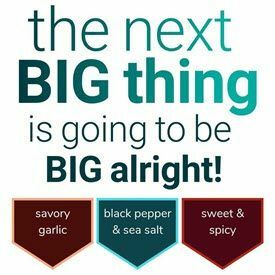 All these great flavors paired with a mild sweetness, a really good natural beef flavor and a little acidity make all the flavors “POP” and together, they create a delectable flavor profile. 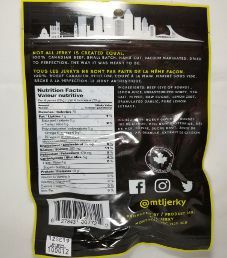 These jerky strips are bite sized and sliced to a medium thickness. The texture is dry and requires a reasonable effort to chew. The unmistakable lemon and black cracked pepper aroma arouses our senses and really piqued our interest. As a side note, I believe it is important to take a moment and talk about the elephant in the room. Most people will probably notice a significant amount of seasoning at the bottom of each bag. As the seasoning is coarsely grinded, this situation is highly likely to occur. It is also fair to say this is normal and not much could be done unless MTL Jerky secures its seasoning to each beef strip with a gun stapler or dip each strip in Gorilla Epoxy. I prefer believing the seasoning is included in the bag intentionally as an option for the consumer to add it as they please to each strip. This allows each consumer to get a full experience instead of been denied such indulgence. What more can I say but let Paul have these last words as he eloquently summarizes and expertly expresses all our sentiments. “The first flavors I detect are the two flavors advertised, the lemon and the pepper, which happen to be two of my favorite flavors. When I order chicken wings, I often order lemon pepper flavored chicken wings, so it’s no surprise I was intrigued with this flavor. Well, it has come through in spades. Along with lighter doses of garlic, onion and natural beef, I am duly being blown away with this delectable flavor of jerky. Holy crap, I’m all in. Throw all my chips to the centre of the table; I’ve just been dealt a royal flush. Flawless, 10/10 guys, no, 20/10. In conclusion, the MTL Lemon Pepper Beef Jerky is a great reminder of such a tasty and classic pairing, it is truly a match made in Heaven. As such, anyone fancying lemon and cracked black pepper is in for a big treat with this jerky flavor. 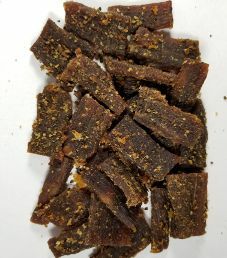 We highly recommend the MTL Lemon Pepper Beef Jerky; it is a beautiful treat. We’ve awarded an Excellent 10/10 taste rating and all Hail Lemon Pepper. A 2.5 ounce/70 gram bag sells online for $8.50. That works out to $3.40 an ounce, which rates as an expensive price. Free shipping is offered on orders over $75. All bag categories are covered here. There is a decent blurb printed on the bag about this jerky. 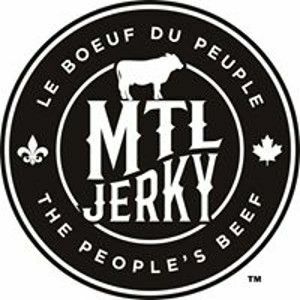 Their @mtljerky social media handle is provided for Facebook, Twitter, and Instagram. English translations are provided for everything.